Auburn Christian Church is governed by a Board of Elders who oversee the Spiritual needs of the congregation. Church business and other activities are managed by an Executive Committee, leaders of church ministry teams, and members of the church. Business meetings are held monthly. Everyone is encouraged to attend. A full-time pastor provides day-to-day spiritual guidance and administrative leadership. Volunteers provide clerical support in the office. Auburn Christian Church, a non-denominational congregation, was founded in September of 1981 by a group of families interested in praying and worshiping together. For several years, members met in individual homes. Eventually, a decision was made to rent the Masonic Lodge Hall in Auburn. Later, with assistance from the Christian Church of Kansas, along with the sacrificial commitment and dedication of member families, a basement meeting facility was constructed at the current location. By late 1984, the church was feeling pressed for space and began yet another building project to add an upper level sanctuary. 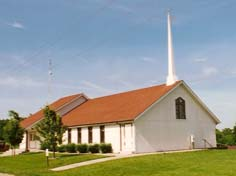 In August of 1995, the present sanctuary and fellowship hall were dedicated. We are a small town church serving people living in Auburn and surrounding communities, including Topeka, Burlingame, Carbondale, Eskridge, Harveyville, Osage City, and Wakarusa. Auburn Christian Church is a family-friendly congregation with activities for all ages! Identity with Jesus Christ comes through baptism. The inspired Word of God is without error. God has equipped the church with spiritual gifts. Anointed teaching produces true Spiritual development. As a community of believers we will worship God. Faithful believers are connected to God and should be fully devoted to Him. Each and every person matters to God. We need to love according to the Great Commandment.